Octane Editor Robert Coucher's only car is his 140 FHC: how has it performed? Having purchased MNJ 812 on August 12, 2006, from Jeremy Wade in Market Drayton - bloody miles from everywhere - I am amazed that 41 months of Jaguar ownership have motored by so quickly. This 1955 XK 140 FHC Special Equipment is an entirely different proposition to my previous diminutive classics which have included a Porsche 912, Lancia Fulvia, Porsche 356 and Alfa Romeo Giulietta Sprint. 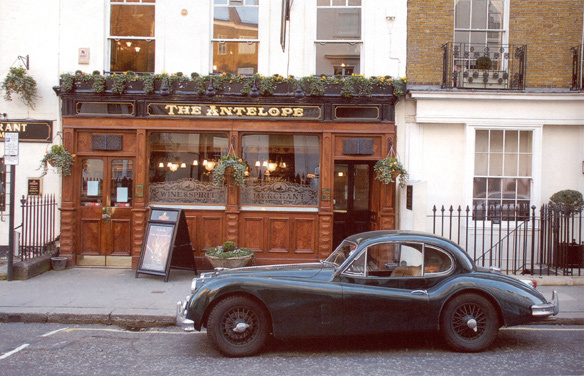 I have always liked Jaguars and, as I refuse to own a modern car- a scooter and public transport are used around London or when the weather is foul-I wanted a car that was suitable for regular use. The Jaguar is equally at home on boring motorways (its sweet spot is 85mph) as it is on enjoyable country roads and in London traffic. It's fast and comfortable and gentle and I just love the way it looks, smells and feels. After three and a bit years of ownership, what have I learnt about the Jaguar XK? It is not perfect: it's heavy, old-fashioned and thirsty and it really needs its few subtle tweaks to make it usable as an everyday car. As the editor of Octane magazine, you will understand I'm fortunate to drive all sorts of great classics. Some are better than you imagine. Many are a lot less so. Many classic marques are mythical and it's often best to leave them at that. 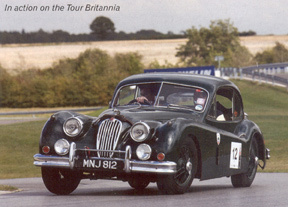 But I have always been impressed with Jaguars, from incredible C and D-types, to smooth E-types and refined saloons. 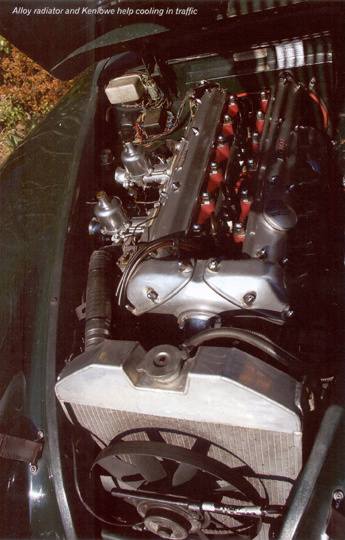 I suppose the heart of any Jaguar is that fabulous straight six-cylinder engine. In road cars it is creamy, in racing cars it is fierce. The 3.4-litre engine in my XK is standard and as such is smooth and gentle. A bit too gentle, actually, because the FHC is a hefty old thing and sometimes a bit more oomph would be appreciated. 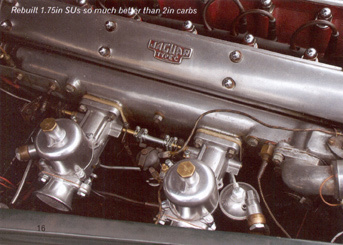 At some point 2-inch SU carburettors were fitted to the 'C-type' head, as it is badged on the XK. Not to be confused with the proper C-type head on a C-type engine. Bigger carbs were a popular if misguided mod in the '60s and '70s, something that does not make sense unless a big-valve head is fitted. Tim Waddingham, who looks after the car, found me a pair of original spec 1¾-inch SUs that were rebuilt by Burlen Fuel Systems. With these in place, the engine is quieter, smoother and less thirsty, with no noticeable drop in power. We dabbled with clever camshafts, but they didn't really work on this engine. I know from past experience that cams are the very last things you should change on a road car and this applies to the XK too. Eventually I listened to the consensus of experienced owners and had a pair of XJ6 cams fitted: these have improved the engine's torque, response and fuel consumption. MNJ 812 had a full body-off rebuild in 1991, so is in solid if patinated condition. It was then owned by Stuart Tizzard, who planned to go racing, so he got stuck into the Broadsport catalogue with gusto, for which I am extremely grateful. The beautiful ally radiator and expansion tank along with an electric fan keep the Jaguar cool. This is helped by a plumbed-in oil cooler. The alternator ensures the batteries are fully charged and the car always starts. The solid-mounted steering rack is firm and almost harsh, but that's fine because it offers pin-sharp steering. Front disc brakes provide effective anchors and the ally petrol tank is nice to have, although the huge racing filler cap is a bit OTT and not lockable, somewhat of a worry on the streets of London. Actually the Jaguar 'failed to proceed' on one occasion when the electric fuel pump packed up. A bash with a hammer got it 'clicking' again, but it was soon replaced with a new item from Burlen. A spare set of fuel pump points always reside in the glovebox, along with a spare rotor arm, another component that can fail. The XK came with the wrong 15-inch wire wheels and fat 205­section tyres, which messed up the gearing, made the steering very heavy and ruined the looks of the car. A set of correct 16-inch wires from MWS sorted things out and they are now powder coated in body colour and shod with a set of effective PIRELLI radials from Longstone Tyres. Another welcome improvement was the fitment of a Quicksilver bespoke stainless steel exhaust system. I have grown out of the need for noisy cars, so'specified a quiet exhaust which suits the nature of the Jaguar and reads just 90dB at the Goodwood circuit noise test. The original Moss gearbox was extremely worn, with hardly any synchro left and this became an issue when the overdrive expired. To get at the O/D the engine and gearbox have to come out. 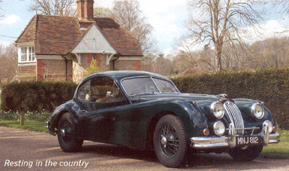 We decided to replace the worn Moss with a Jaguar 4-speed synchro 'box and to rebuild the O/D to competition spec. A vast improvement, especially as Tim Waddingham carefully mated the later 'box to the original gearshift lever so no ugly modern gearshift sprouts from the floor. A 5-speed gearbox is another option, but not one I want, as I enjoy flicking the Jaguar into O/D and seeing the transparent switch light up on the dashboard. The original clutch is heavy and this can be changed to a lighter hydraulic unit (electric power steering is also an option! ), but as I still have my own hair and teeth, I will resist such girly mods. MNJ 812 has done 11,500 miles since I bought it and this includes a run down to Le Mans with a number of fast laps around the long circuit, where over 120mph was showing on the speedo. It has enjoyed numerous track days at Goodwood, Castle Combe, Silverstone and Donington as well as the excellent Tour Britannia in September last year, covering some 850 fast miles. After all that, it went into the impressive Twyford Moors workshops in Hampshire for some extensive attention. The rear chassis leg had corroded, which is a difficult job to get at and fix correctly. The fuel tank was leaking (again not helping the fuel consumption), the rear brakes were shot and the front suspension was worn. The team at Twyford did a splendid job of getting the XK back into shape and it returned feeling years younger. Details like tightening up the loose and rattling driver's door, fitting new ball joints and getting the brakes to work spectacularly well have really improved the XK. So, what has been learnt? An XK can be an effective long distance car and it is easy to live with as long as some sensible upgrades are carried out. We know the cooling system and brakes are the obvious areas in need of improvement. But an alternator is a good idea, as is an electronic trigger in the distributor to replace the points. A fresh fuel pump is essential and radial tyres work in the real world. Most replacement rotor arms are rubbish and I am not convinced about the gas dampers, as they are very hard and bouncy even when on the softest setting. Inertia reel safety belts from Quickfit are a pleasure, especially as they can be specified with a chrome buckle and not the ugly modern black plastic attachment. The Jaguar's interior gets hot, so smothering as much of the firewall as possible with heat insulator helps to some degree. Bodywork is tough, but it does corrode and the separate chassis shakes all the body fittings about a good deal. Effective underbody rust protection is a must, especially at the rear of the chassis above the back axle. The XK boot is very small, so the added space in the 140 FHC behind the rear seats is useful for stowing soft bags and luggage. I used to prefer the purer looks of the XK 120 FHC, but I now like the looks of 140 as much and appreciate its engineering and ergonomic improvements. Can I, at this stage, think of a more desirable classic car with which to replace the XK? No. All I now want is a more powerful engine and a longer rear axle ratio to improve the Jaguar's impressive long distance cruising ability.